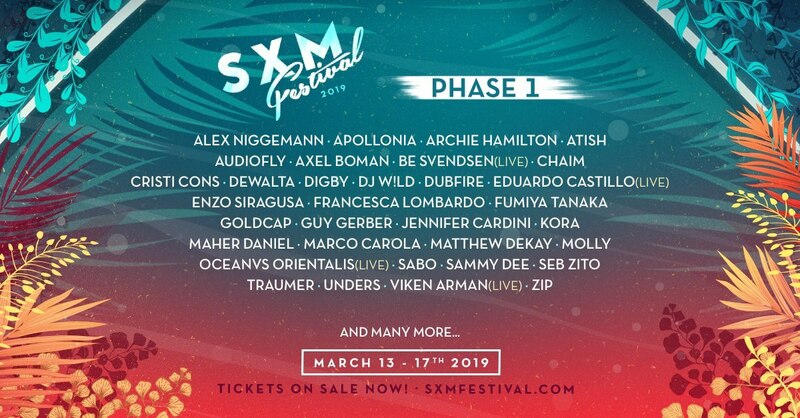 SXM Festival will return to the Caribbean Island of Saint Martin/Sint Maarten next year for the first time since a series of hurricanes in 2017. The event organisers were forced to cancel 2018’s edition while concentrating their efforts to create the Two Bunch Palms Foundation to raise funds to help those affected by Hurricane IRMA and to give back to causes important to the development and health of the community. Now the island is ready to host SXM in 2019, running from Wednesday, March 13th to Sunday, March 17th. The line-up includes Alex Niggemann, Apollonia, Audiofly, Axel Boman, Chaim, DJ W!ld, Dubfire, Eduardo Castillo, Enzo Siraguza, Francesca Lombardo, Fumiya Tanaka, Goldcap, Guy Gerber, Jennifer Cardini, Kora, Maher Daniel, Marco Carola, Matthew Dekay, Molly, Oceanvs Orientalis, Sabo, Seb Zito, Traumer, Unders, Viken Arman and Zip. SXM Festival Founder Julian Prince said: “It is very hard to put in words how excited we are to be back to work on producing SXM Festival 2019. This has been an incredibly emotional time for the local community and the partners that make this event happen. But through these adversities I believe the island and our team have emerged stronger than ever with an unbreakable bond that is destined to produce something incredibly special. We have the intention and ability to design the ultimate party – SXM Style. “Locals are ecstatic to host everyone and in 2019 the energy on the island will be as magnetic as it has ever been! It is with such local spirit and the support of our amazing global community that we return with more momentum and vigor than ever before. Ironically, we always say that we couldn’t imagine what would come out if we had an extra 4 months to organize the festival. Like every precious moment in life, SXM Festival is not to be taken for granted as it was almost taken away from us right before our eyes. For tickets and details go to sxmfestival.com.